A while ago I talked about a paper that demonstrated that cancers establish a long-term equilibrium with the immune system. That paper provided a formal demonstration of a concept that was already widely accepted — that cancers can arise and persist for a long time in balance with the immune system, so that the immune system isn’t able to completely eliminate the cancerous cells, but the tumor is not able to grow or spread, either. Evidence in humans shows that this equilibrium can persist for many years. In some cases, the tumor may eventually mutate to a form that can more completely avoid the immune system, and those tumors become clinically detectable. In other cases, perhaps, the immune system may finally destroy all vestiges of the tumor, and the person won’t ever know that he was carrying the potentially-cancerous cells; or the balance may persist for a lifetime, until the person dies of something altogether different. There was an interesting implication to that concept that I had overlooked, because it doesn’t fit with the conventional understanding of cancer development. A paper from last month1 proposes a new and rather troubling model. People rarely die of a primary tumor; the direct cause of death is usually metastatic cancer. The prevailing models of cancer development suggest that metastasis is a late event in cancer development. (I believe this concept was first articulated by Fidler in 1978,2 although in retrospect this paper only argues that metastasis is the product of a subset of selected cells from the tumor — the concept that a tumor is not a homogenous entity — not that the selection process that leads to the metastatic subset must necessarily occur late in the cancer’s progression.) 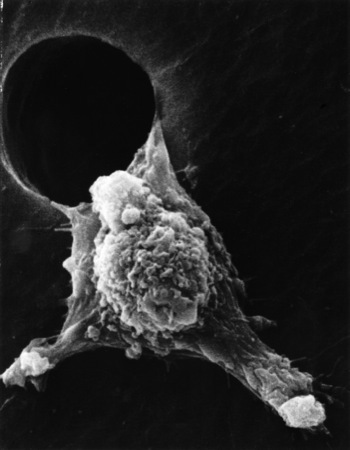 Hanahan and Weinberg, in their immensely influential 2000 paper “The Hallmarks of Cancer”,3 discussed “Tissue Invasion and Metastasis” as the sixth and final “acquired capabilities” of a tumor, and show metastasis as the final event in four of the five pathways they illustrated, and as the penultimate event in the other one (see the figure to the right here; click for a larger version). Our hypothesis of an early MET [metastasis. IY] initiation questions the morphological and genetic correlation between the primary tumour and MET, because the primary tumour at the time of dissemination would have been much smaller and probably had prognostically favourable characteristics. The paper I’m talking about here,1 from HÃ¼semann et al, takes this argument a couple of steps further. Not only can metastases arise very early in the course of cancer development, they say, metastases can even arise before the cells are fully malignant. 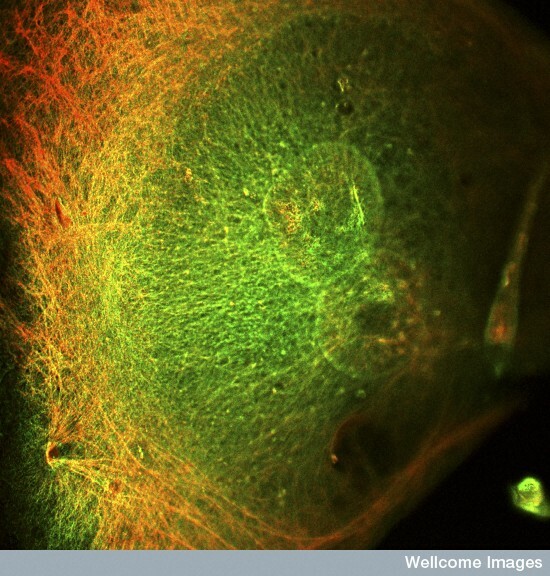 Using a mouse mammary carcinoma model in which mammary tumors arise in a predictable fashion, they were able to detect the premalignant mammary cells in the bone marrow as early as 4 weeks – before outright tumors had arisen in the mammary tissue itself — and these early-spreading cells were able to cause cancer in irradiated (immune-deficient) mice after bone marrow transplant. One provocative finding of our study is that, in mouse models of breast cancer, large tumors seed neither more nor genetically further-advanced cancer cells than do small lesions… Thus, the ability of metastatic dissemination does not appear to be the result of selection of tumor cells within the tumor. Rather, the data suggest that tumor cells disseminate early and will be selected for outgrowth at distant sites. The most likely explanation is that there is some growth restriction on metastases. For example, perhaps the primary tumor secretes growth factors systemically, which permits the metastases to expand. Or — and this is a possibility the authors didn’t really discuss, so I’m not sure if there’s some obvious flaw that I’m missing — the immune system may hold the small tumors in check for a while until the metastases manage to evade equilibrium with the immune system. I wonder if this could be a regulatory T cell (TReg) effect, in which the primary tumor is able to expand and then conditions infiltrating lymphocytes to become TRegs; we know that TRegs circulate, so perhaps these circulating TRegs then shut down the ongoing response to the metastases as well, and allow them to grow out. In any case, this observation (assuming it holds up) changes some of the concepts of cancer therapy, I think. If the metastases are already out there, then some of the rationale for removing the primary tumor is gone. On the other hand, there’s a potential opportunity there, too: If something prevents metastases from growing out and causing a problem for a long time, perhaps that something can be harnessed and used to prevent outgrowth for a lifetime. Please, could you explain to me what is represented in this last figure of yours? I would like to use it in a poster I am doing for a conference on mathematical modelisation of metastatic cancers. Also could you tell me where did you get it from?